This is a collection of Native American lore from Texas. It is focused on the Tejas, a Caddoan group which called itself the Hasinai. 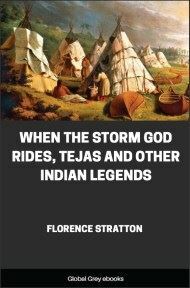 Written in a simple declarative style to appeal to young readers, When the Storm God Rides is not a work of ethnology, but is based on genuine traditional folklore from the region. The shores of Texas along the Gulf of Mexico did not always have islands along them. 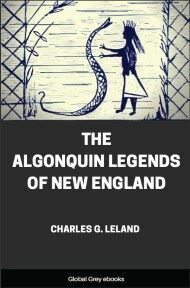 The Indians who lived a long time ago on the coast have left behind them the story of a god and his great black-winged thunder bird which he rode like a horse over the Gulf at certain times. He was the Storm God, and he made islands where none had been before. These islands were made as homes for the wild birds, the sea gulls, the big pelicans, the cranes and the herons. The god of storms did not live among the Indians, but lived down in the warm seas below the Gulf of Mexico. And for this the Indians were glad, for his terrible thunder bird, named Hurakan, filled the people with fear. The tribes which lived near the Gulf only saw the mighty god when he rode his thunder bird through the skies. He visited their land when he wanted to get the white and colored feathers of birds living on the seashore for his cloak. The Indians could tell when he was on the way. As Hurakan, the thunder bird, came swiftly through the air over the gulf, the sky in front of him became filled with bits of white clouds sailing high over the beaches. Then the wind began to blow, first here, then there. At last came the great thunder bird in the shape of a cloud which closed the eye of the sun and made the land dark. Then the wind grew strong and howled and blew as the god and his thunder bird came flying through the sky. The Indians ran into their wigwams and held them down as best they could while the Storm God rushed by and snatched feathers from birds to put on his cloak. The Indians were happy when he was gone because Hurakan made them afraid. Even today Hurakan comes back once in a while in the shape of a storm which people call a hurricane. There was a day when the peaceful tribes who fished in the Gulf were driven away from their homes by fierce tribes from the north. Unlike the Indians who lived on the coast these tribes liked to kill. When they saw the birds flying around, they shot them with arrows. They caught them on their roosts at night. They robbed their nests. The poor birds cried out at the tops of their voices for the Storm God to save them. Far off down in his home in the warm seas the god lifted his head and heard their cries. Quickly he rose to his feet and shook himself. Thunder broke loose over his head, so angry was he. He ran and jumped upon the back of Hurakan. He shouted for Hurakan to hurry. Shooting fire like lightning from his eyes and shaking loose black clouds from the tips of his great wings the Storm God's thunder bird flew toward the Texas coast. He and the god were wrapped in darkness, and as they flew across the sky the day became like night and the waters of the Gulf broke into white foam. The Indians who were killing the birds saw the thunder god coming too late to get away. The sun was gone and the clouds were so thick that the day was like night. The wind from Hurakan's wings hit the Indians and blew them down when they tried to run. Behind them came the waters of the Gulf, pushed upon the land by the wind stirred up by the Storm God's thunder bird. The wind ` blew the birds high in the air, but it drove the water into the camps of the bad Indians and scattered their homes and made the Indians climb into trees. The Gulf now poured far inland over the prairie, and the prairie was like the sea. Everywhere was rolling water, leaping waves, crying winds. High above the earth the Storm God rode his thunder bird and shouted with joy while the wind blew his long hair loose through the flying clouds. At last the god went away. As he left, the waters of the Gulf began to roll back from the land, and when they reached the ocean bed again they dropped the mud and sand they had torn loose from the land and brought with them. The mud and sand began to pile up. Soon many islands were forming. They rose higher and higher as the waters kept dropping their loads of earth around them. When all was done the Texas coast was dotted with islands that were new homes for the birds. Indians could not reach those birds any longer. The pelicans, the gulls, the sand pipers and all the others now went to their new homes and made their nests where they could be safe and where the Storm God could find them when he wanted new feathers for his cloak. To this day those islands remain. Dwarf trees, cactus plants, weeds, grasses and flowers cover them like fairy gardens. And thousands of birds live on them, sing amid the bushes and bathe in the little pools left by the rains. During spring and summer they lay their eggs and raise their little ones. They are happy and safe from men, because long ago the Storm God built the islands for them.